Long time readers of Geek of Oz will know that I'm a sucker for those shape shifting mechs known as Transformers. Ever since I was a kid they've held a special place in my heart so, to be honest, I was bound to enjoy Transformers Rescue Bots. Hell, I even liked the Michael Bay films in spite of how terrible they are! Optimus Prime issues a call to all operational Autobots for urgent assistance on earth. 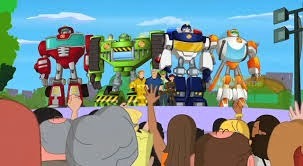 Answering the call are Heatwave, Blades, Chase and Boulder who arrive in the US state of Maine to the news that they are the last remaining Rescue Bots. Unsure as to whether the new team members are ready to battle the Decepticons, Optimus tasks the Rescue Bots to work undercover, assisting the local townsfolk whenever they're in need. 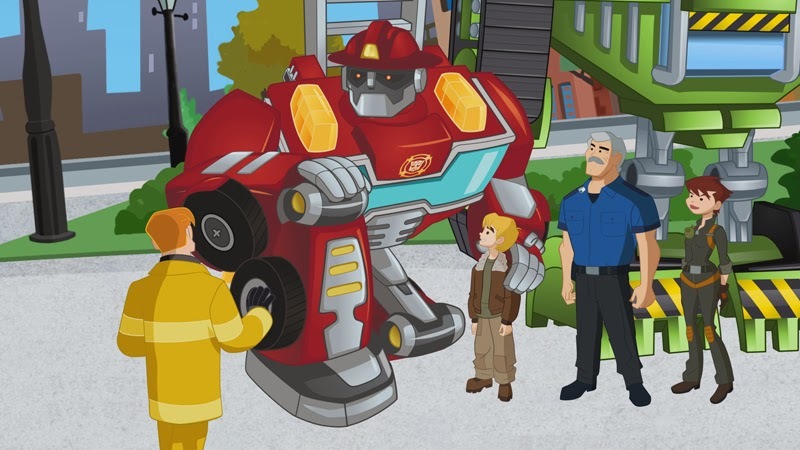 The first thing that strikes you about Rescue Bots is that this is especially for young kids. Sure, cartoons in general have a tendency to be targeted towards a younger demographic but this particular series is probably aimed at 3-5 year olds with a identifiable Playskool feel which is in line with the series' toy releases. The simplistic character designs are far removed from the designs of Michael Bay's films and are more recognisable as Transformers than their feature film counterparts. The trade off for such simple yet cool looking designs is that the transformations are generally glossed over wherein the robot just becomes a car without going through each step of the process. The only real downside to this is that we aren't treated to the usual transformation sound that we all know and love. The animation quality of Rescue Bots is quite good although not quite as showy as you'd expect from the likes of Ben 10 or the latest Avengers series. This is understandable considering the target audience but may lose the interest of some older viewers. Bright, primary colours are sure to grab the attention of young ones with the eventual pay-off of a "message of the day" ending not too dissimilar to G.I. Joe's "Knowing is half the battle..." sign-off. The messages included in each episode aren't particularly subtle and are instead handled with a ham, or rather steel, fist. Again, considering the target audience, this isn't necessarily a bad thing. It's great to see a TV program that goes out of it's way to remind kids of important life lessons. However, it's a bit of a pity that there are so few female characters in the mix. This first volume is reasonably well priced at just under $13 for 5 episodes including the introductory Hotshots, Family of Heroes, Under Pressure, Flobsters on Parade and The Invasion of Griffin Rock totally around 2.5 hours of colourful and wholesome fun. 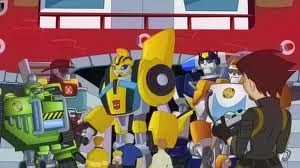 Sure, this series is aimed at little tykes but long time Transformers fans are sure to get sucked into a vortex of nostalgia. It doesn't feature epic battles or sweeping story arcs like Generation 1 did but what it does deliver is a series that somewhat bridges the gap between pre-school and kids TV. Not too kiddy, not too grown up, just right. 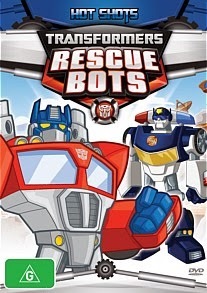 Transformers Rescue Bots: Hot Shots and Cody on Patrol are both available now. Transformers Rescue Bots: Return of the Dino Bot is available from the 5th of February 2014.